World's Best Alarm System Guarantees? In the cut-throat intrusion alarms industry, guarantees can make or break deals. 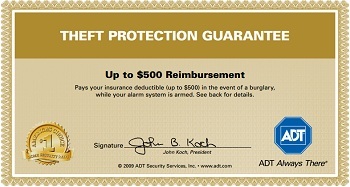 Few companies have guarantee policies as bold as ADT, who issue several incredible promises, including $500 reimbursement if a theft occurs and full reimbursement for up to 6 months. Are these policies empty sales tool fluff, or do they carry value and distinguish ADT in a crowed market? In this note, we break down each policy, explain them, and evaluate their value to end users. The strongest guarantee offered is the "Theft Protection" policy. This element promises to "pay an ADT customer's insurance deducible up to $500 in the event of a burglary while the alarm system is armed". Simply put, the certificate is redeemable for cash if the alarm system fails to protect against material losses. "All of Customer’s doors and windows were locked" - Regardless of how effective the alarm system operates, the customer still must demonstrate they secured all common entry points with locking hardware. This could be difficult to prove unless documented at the time of a police report. "Customer is not in any way in default under the ADT Residential Systems Customer’s Order" - Bluntly, the customer must be current on service and monitoring payments. 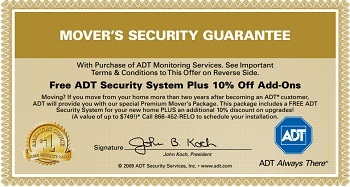 Additionally, the customer cannot attempt to break the contract relationship with ADT during this time. "Customer provides ADT with copies of the insurance claim report, the police report within sixty (60) days of the property loss and proof of settlement by insurance carrier" - Finally, the customer must submit a full case of records, from the initial policy report to settlement agreement within sixty (calendar) days. While most burglary investigations and insurance companies act swiftly, there may be some instances where the customer exceeds the time afforded by the guarantee waiting on 3rd parties to file proper paperwork, at no fault of their own. Proving all of these conditions are met may be more hassle that its worth. This policy offers to extend the 'satisfaction guarantee' period to 6 months, including subsequent monitoring fees. Given the value of this promise can exceed $1000 if taken full term, only large installation companies are able to offer it 'no questions asked'. "If during the six months following installation we are unable to resolve any installation/service-related concern, we will refund the installation charge and/or any monitoring fees paid after we have attempted to resolve your concerns." This is clearly NOT a 'no questions asked' type policy, giving ADT the power and right to refuse refunds under the claim they have resolved the installation/service issues. The basic intent of this policy is to incentivize an existing ADT customer faced with relocation to stick with the company wherever they move. The verbiage states that the bearer is entitled to a "free security system, plus and additional 10% in ungraded equipment (up to $749)". The stipulation of this policy is that the customer must have been with ADT for at least two prior years before moving, and must sign a renewed contract for 36 months for monitoring the new system. 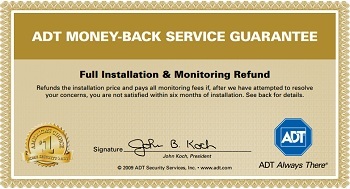 Another guarantee is to offer 'manned response' within a certain period of time to every alarm. In this situation, the service guarantee is a live guard arriving onsite when the system is tripped and can interdict personally before Police or other authorities are alerted. In this type of system, 'false alarms' are not mitigated, but they are prevented from distracting municipal Law Enforcement of Fire Department resources. This concept is limited to specific regions/municipalities based on travel within a geographic area. For example, Provident Security offers such a service in Vancouver, Canada and guarantees a '5 minute local response' to any alarm customer. Because the guarantee is totally reliant on speed of local response dispatch, the concept is not scalable on a national level. However, despite (or perhaps because of) the limitations of geography, the same approach cannot be adopted by a large alarm company and is a successful and competitive advanage for a smaller player. The ADT guarantees offer some benefits but come with significant conditions that can limit the usability and overall value of them. The Provident guarantee is attractive to high end residences who want rapid response but, of course, is limited to a single small region.